Image Caption: An artistic rendition of the Neutron star merger discovery announced on 16 October 2017. 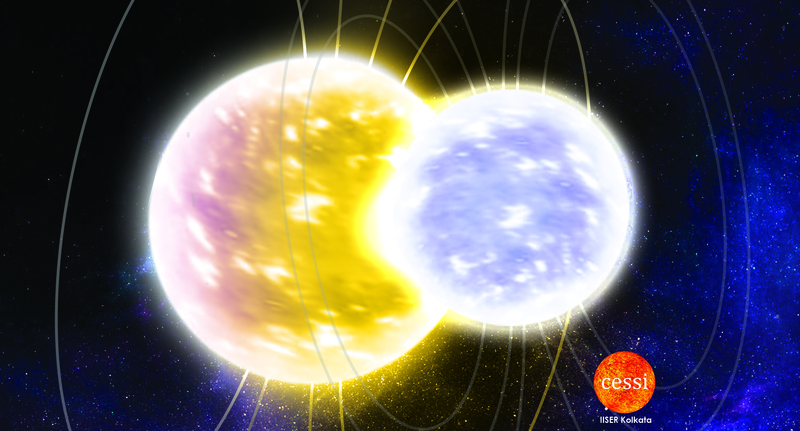 The image shows two Neutron stars about to merge. The process leaves signatures in both gravitational and electromagnetic waves whose detection and exploration can potentially revolutionize our understanding of the Universe. The very high energy released in this process sustains exotic phenomena that may have produced a major fraction of the Gold in the Universe. Indian scientists from around the country, including scientists from IISER Kolkata, are part of a global team who struck gold, literally, detecting a massive cosmic explosion associated with the collision and merging of two neutron stars. This is the first time such an event has been detected. At a time when Indians are poised to celebrate Diwali the festival of lights, this discovery is metaphorical and relevant in many ways. Beyond being a cosmic firework of epic proportions, such events, long theorized but detected for the first time only now, are believed to produce a major fraction of the gold in the Universe, which find use in science to ornaments. This discovery is also extremely significant given that this is the first time that both gravitational and electromagnetic waves from a cosmic event were detected together. Detectable gravitational waves are typically generated when two extremely heavy and dense stars such as black holes and neutron stars collide. But by their nature, black holes do not allow electromagnetic radiation to escape. Most of our understanding of the cosmos is based on observations of electromagnetic waves which generate visible light, radio waves, Ultraviolet rays, X-rays and Gamma rays. With this joint detection, the era of multi-messenger astronomy is born, which is expected to revolutionize our understanding of the Universe. Neutron stars are one of the smallest stars in the Universe and form when a star much more massive than the Sun runs out of nuclear fuel and collapses to form an extremely dense and small object. It is heavier than the Sun but its diameter is the size of an average city like Kolkata. A spoon of neutron star material can be as heavy as the Mount Everest. They are held together by a balance between gravity and a quantum phenomena known as degeneracy pressure, have magnetic fields which are more than a thousand billion times stronger than that of the Earth and spin very rapidly at rates of few hundred times per second. These characteristics make neutron stars an exotic object holding clues to many mysteries in science. The signal from this neutron star merger arrived on 17 August 2017 from far outside our galaxy. Scientists tracked them for about 100 seconds while they spiralled towards each other in a final cosmic dance. The collision created a short burst of Gamma rays that hit Earth-orbiting satellites two seconds after the gravitational waves were detected by LIGO and VIRGO observatories. The near-simultaneous detection of both gravitational and electromagnetic Gamma waves confirms that gravitational waves indeed travel at the speed of light, as predicted first by Einstein. This detection follows a line of extraordinary breakthroughs in gravitational wave astronomy, with Indian contributions, which led to the 2017 Nobel Prize in Physics. Many decades ago, Subrahmanyan Chandrasekhar, another Nobel Laureate of Indian origin, had provided important physical ideas for the existence and masses of neutron stars. The existence of both gravitational and electromagnetic measurements has already resulted in a new and independent measurement of the Hubble constant - the expansion rate of the Universe. Changes in this expansion rate hold vital clues to interplay of matter and energy distribution that governs the dynamics of the Universe and its ultimate fate as in whether it will continue expanding forever or collapse in a big crunch. Therefore its precise measurement is of vital importance. The cosmic explosion associated with this neutron star merger and the extreme energies involved are crucially relevant for us. On the one hand it shows that short Gamma Ray Bursts originate in these events. It is theorized that there are multiple neutron stars in our own galaxy, the Milky Way. If by chance any of them collide, and a Gamma Ray Burst is directed our way, this might cause a mass extinction event. However, astronomers estimate the likelihood of such collisions in our galaxy to be very, very low to be of any concern. On the other hand, the availability of an abundance of neutrons in a collision involving two neutron stars and the extreme conditions this create are suitable for generating heavy metals such as Gold, Uranium and Plutonium. In this cosmic cooking pot, neutrons bombard the central core of atoms of an element at a rate faster than they can break down resulting in rapid neutron capture - the elusive r-process, which results in the formation of higher mass atoms such as gold. Indeed, in what could be termed as a Diwali gift from scientists, we may have just discovered the source of the cosmic gold that adorns every piece of jewellery and ornament on Earth! The Center of Excellence in Space Sciences India (CESSI) at IISER Kolkata plays an active role in the international LIGO Scientific Collaboration (LSC), through the IndiGo consortium. Dr. Rajesh Nayak and PhD student Ms. Anuradha Samajdar (currently at Nikhef, Netherlands) from CESSI and Department of Physical Sciences are part of the IndIGO-LSC collaboration. Their work at IISER Kolkata are focussed on testing Einstein's theory using gravitational waves, and is being done in collaboration with Dr. K. G. Arun (CMI-Chennai), Dr. Chandra K. Mishra (IIT Madras) and others. An important mandate of the MHRD established Center of Excellence, CESSI at IISER Kolkata is to utilise gravitational wave data to explore exotic phenomena in the Universe. In addition, CESSI is also a key player in the development of the LIGO-India observatory. This project, approved by the Union Cabinet of India Chaired by the Prime Minister, will change the face of gravitational wave research, both in India and globally. "IISER Kolkata is looking forward to continued collaboration with the international LIGO community as well as various Indian institutions to realise the dream of the LIGO-India observatory", says Prof Sourav Pal, who recently took charge as Director of IISER Kolkata. "We will strongly encourage student participation in this project through the IISER system - not just to utilise the LIGO detectors scientifically, but also to build the human resource to take on the challenges of engineering and big data mining", said Prof Pal. The LIGO-Virgo results are published today in the journal Physical Review Letters; additional papers from the LIGO and Virgo collaborations and the astronomical community are going to appear in Nature, Astrophysical Journal and elsewhere.